After a day of claiming up to 82 civilians were "shot on the spot" by Syrian forces battling to retake the northern city of Aleppo from armed terrorists who have occupied it since invading the city in 2012, no evidence or even the source of the claim has surfaced. 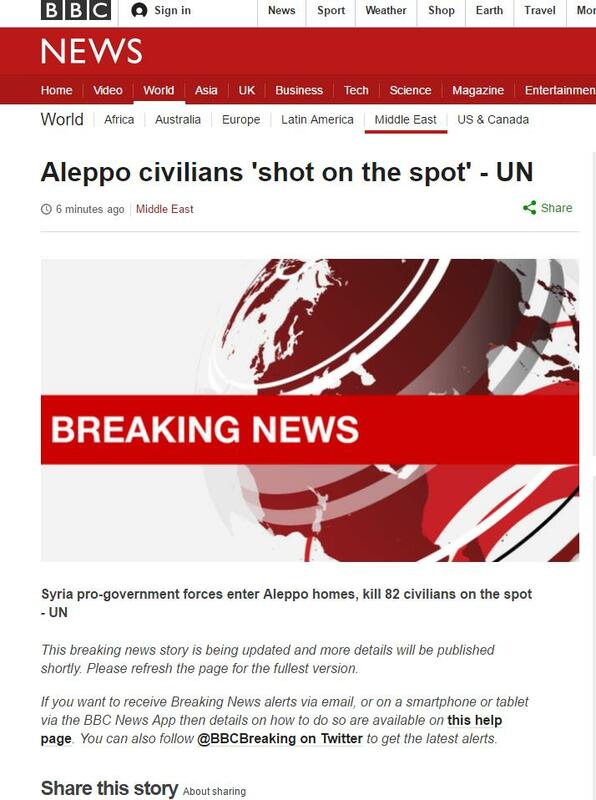 According to the BBC, the UN Human Rights office in Geneva received reports of the incident. Despite Western journalists having been on the ground in Aleppo, along with UN staff, the reports were actually received in Geneva from unnamed sources alleged to be in Aleppo, not acquired - or verified - on the ground by either the Western media or UN staff. It should be noted that the BBC left the accusation on their website for hours before eventually adding that the reports were both unverified, and acquired by "sources," not by UN staff firsthand in Aleppo. The purpose of this was to maximize the initial impact of the shocking, easily "re-tweeted" headline without being burdened with providing evidence. Once the headline went "viral," the BBC eventually filled in the details - which had they been included in the initial report - would have significantly blunted the impact of the headline. With talk of "fake news" reaching hysterical levels, the BBC in collaboration with the UN itself prove that organizations and institutions of the West have long held a monopoly on generating "fake news" and leveraging it not just to manipulate politics and public perception, but to perpetuate war and the destruction of human life. A day after the Western media's coverage of Aleppo reached a fevered pitch, and with the fighting effectively over, other lies repeated ad nauseam just a day ago are now surfacing as obvious, malicious fabrications. 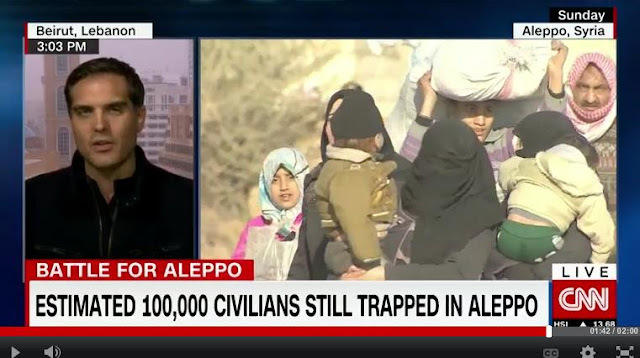 CNN in a report titled, "Estimated 100,000 civilians trapped in Aleppo," admits that the supposed "rebels" only hold, "a few streets, a few blocks, maybe a neighborhood," admits that it is "very difficult to verify any of these reports," and repeatedly uses the term "might be" in reference to the supposed 100,000 civilians the Western media and the UN claim are still in "eastern Aleppo." Of course, with evacuations underway now, it is clear there were nowhere near 100,000 civilians left in the remaining territory occupied by armed militants, revealing yesterday's news coverage of just the latest in a long line of politically motivated performances carried out by an otherwise unjournalistic Western media. Patrick Cockburn in a UK Independent article titled, "This is why everything you’ve read about the wars in Syria and Iraq could be wrong," attempts to offer a conciliatory explanation as to why the Western media's coverage has been so divergent from reality. It is too dangerous for journalists to operate in rebel-held areas of Aleppo and Mosul. But there is a tremendous hunger for news from the Middle East, so the temptation is for the media give credence to information they get second hand. 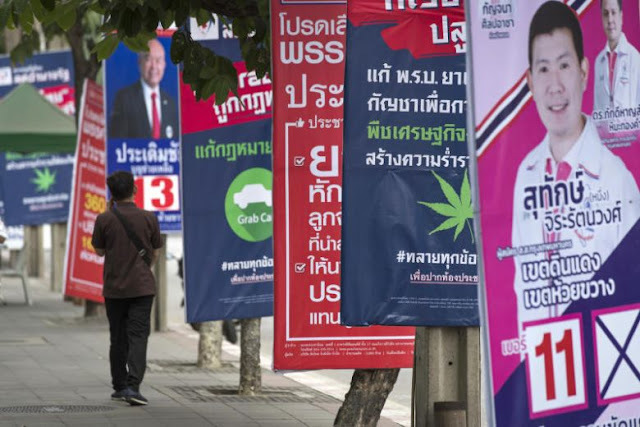 Cockburn also notes that much of the overt bias and poor reporting coming from across the Western media is politically motivated. When the light of reality began showing through in reports from journalists, experts, and diplomats, leadership in Western capitals intentionally ignored it, fixated only on regime change. Image: A lady making claims in a Skype call is not evidence. But CNN and others have no qualms reporting their claims as if it were real news. And while CNN defends this practice of repeating unverified claims by "activists" in Syria, they have intentionally ignored pro-government bloggers for years, proving it is an agenda that has skewed their reporting, not a lack of access to the conflict and its participants. And while the Western media itself has attempted to use its inability to report from on the ground as an excuse for repeating verified lies told to them by their "sources" in Syria, it should be noted that an equal or greater number of pro-government bloggers have been covering the conflict since 2011 as well, only to be intentionally ignored, even attacked by the Western media. This goes far in explaining why the Western media finds itself eagerly defending militants who by all accounts are dominated by Jabhat Al Nusra, a US State Department-designated foreign terrorist organization and repeating their propaganda no matter how absurd. Those across the West listening to this coverage would be led to believe that the hospital to population ratio in eastern Aleppo was nearly 1:1, that every inhabitant of eastern Aleppo was either a doctor, a woman, or a child, and that the remaining neighborhood amid the battle for the city housed a population larger than the entire city of Idlib, the defacto terrorist capital of Jabhat Al Nusra in Syria. It is important to expose these lies, because while the city of Aleppo has been fully liberated, Idlib, Al Raqqa, and now once again Palmyra remain battles yet to be fought. The capacity of the West and its proxies to destroy peace and security for the people of Syria rests in their capacity to continue lying about the nature of Western involvement in Syria in the first place. Undermine this capacity, and undermine their ability to disrupt and destroy the future of Syrians any further.